This happy duck waddles around and flaps his wings to the tune of “The Birdy Song”… it won’t be long before you want to stop the annoying repetitiveness! Grab him up by the neck while dancing and he will scream and cluck like mad – flapping his wings and feet as you are gagging and choking him! No matter how many times you choke the duck, it’s intent on finishing that damn tune! 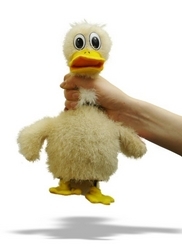 Saw this stress toy call Choke a Duck on Slash Gear and it is on sale for £14.99 at Gadgets.co.uk and there’s a funny demo video on the website as well. Think I’ll be needing one of this for my office but too bad there’s no mute button on it.